Today's Fabergé object is something that will help you see more clearly - a magnifying glass! It was made by workmaster Mikhail Perkhin, sometime between 1896 and 1903! 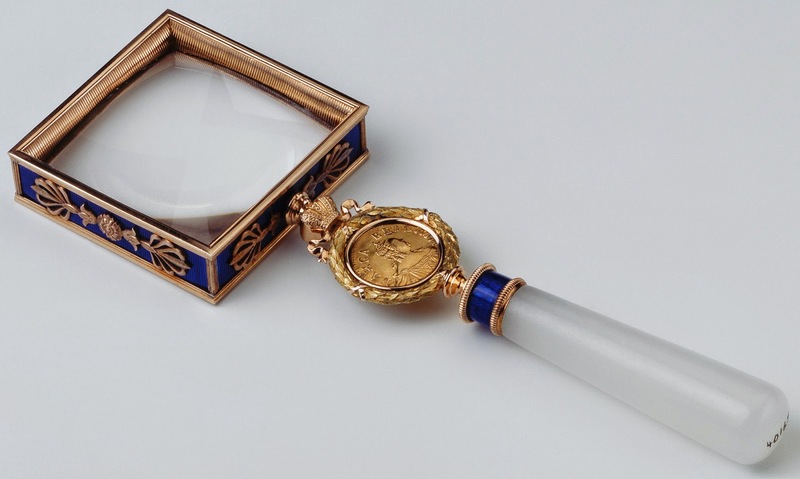 The square lens of the magnifying glass is held in a gold frame, covered in blue guilloché enamel decorated with gold neo-classical ornaments. The handle is carved out of chalcedony and set with a blue enamel band. A gold laurel wreath, topped by the Russian imperial crown, holding a gold rouble coin from the reign of Tsarina Elizabeth, dated 1750, connects the handle with the framed lens. The magnifying glass can now be found in the Royal Collection.